Not only did we receive a brand new Service Pack for SQL Server 2016 this week, since yesterday we are able to play with the first Community Technology Preview (CTP) of SQL Server vNext! Since I adore the Query Store feature which was introduced in SQL Server 2016, a large portion of my time today went to finding out what has changed so far for the Query Store in vNext CPT1. Below is a list of changes I have found so far. Ok technically this isn’t a change in SQL Server vNext, the new “Queries with forced plans” built-in report is available when you install the new version of SQL Server Management Studio which has support for SQL Server vNext CPT 1. The new “Queries with forced plans” built-in report can be used to monitor execution plans we forced through the Query Store. This is a great new addition to the built-in reports and makes keeping track of your forced plans a lot easier than having to query a DMV. The report also directly shows you the performance of forced execution plans in the “Plan summary” graph so you can easily identify performance related issues. Nothing about this new Stored Procedure is documented yet so its uses remain a mystery a bit longer. query_store_db_settings_and_state Periodically fired with Query Store settings on database level. query_store_db_cleared Fired when Query Store is cleared for a database. I nominate the query_store_db_settings_and_state for most vague Extended Event description of the year :-). And finally, one new additional Wait Type is added QDS_HOST_INIT. 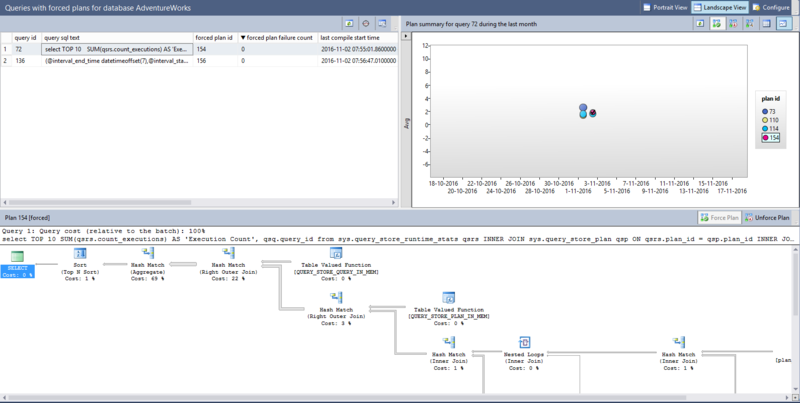 As you can see lots of new Query Store stuff is making its way in SQL Server vNext. Keep in mind though this is still CTP 1 which means a lot can change before the final release!